Asian American LEAD Updates! : AALEAD Maryland's Holiday Party! 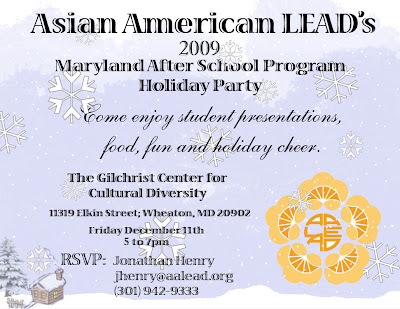 Those of you who have been follow AALEAD on our blog are invited to our Maryland Holiday party this Friday! Students and families from our Middle School, High School, Mentoring and Family Strengthening Programs will all be in attendance, as well as supportive members of the community. We are planning an exciting evening of student performances, contests and reflecting on the year to date, so if you have time, please come out and enjoy some food! Hope to see you on the 11th! If you have any questions or would like to RSVP, please feel free to call or email jhenry@aalead.org. AALEAD Maryland's 2009 Holiday Party! AALEAD celeberates Holiday Party in DC!